Sheraton Grand Bangalore Hotel at Brigade Gateway announced the appointment of Radhika Dewan as Director of Sales. Radhika comes with over 10 years of experience in sales and marketing domain with commendable knowledge and expertise. 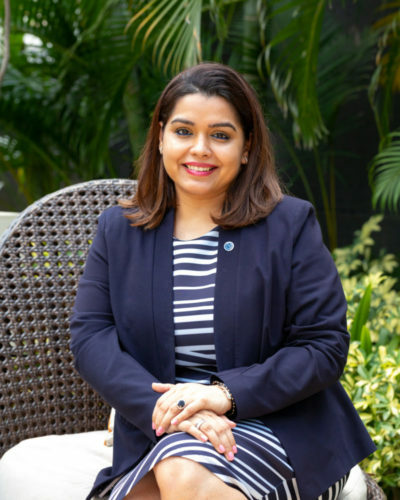 Prior to Sheraton Grand Bangalore Hotel at Brigade Gatewy, Radhika held the position of Director of Sales at Fairfield by Marriott Rajajinagar where she was involved in strategic implementation and development of the hotel. Subsequently, she was associated with other Marriott and Accor properties like JW Marriott Mumbai Juhu; JW Marriott Mumbai Sahar; Renaissance Hotel & Convention Centre, Lakeside Chalet, Mumbai; Courtyard by Marriott Mumbai International Airport; respectively that shaped her career. She began her journey with Renaissance Hotel & Convention Centre, Mumbai as a management trainee and moved on to Goa Marriott Resort, Panjim in 2008. Later, she was part of the pre-opening of Courtyard By Marriott International Airport, Mumbai and Jaipur Marriott. All through her career, she was involved in various stages right from the pre-opening, during the launch and post-launch of JW Marriott Hotel New Delhi Aerocity; Grand Mercure Goa Shrem Resort and Novotel Goa Shrem Resort. She has been instrumental in executing excellent customer service operations to drive customer satisfaction and loyalty programs. Her stint with the Marriott family for 10 years enabled her to master the art; she has successfully executed sales strategy from her past experiences, knowledge of the market, and best practices. Radhika is a performance-driven individual with a keen focus on enhancing customer relationships through FAM trips, the segment focused meetings among others. She has displayed true leadership skills by training her team, offering guidance and encouraging them to perform to their full potential. When not at work, Radhika enjoys her ‘me time’ soaking under the sun at exotic beach locations. Radhika Dewan, Director of Sales expressed, “I have always been a part of the Marriott family; my association with their properties has contributed tremendously to my growth trajectory. I am very delighted to continue my journey with Sheraton Grand Bangalore Hotel at Brigade Gateway, which will surely be another feather to my cap. I am excited to be a part of this brand”. Mr. S. Sujeet Kumar, General Manager, Sheraton Grand Bangalore Hotel at Brigade Gateway said, “We are very glad to welcome Radhika on board. Her involvement with various renowned brands under Marriott umbrella is a testimony of her hard work and forward thinking capabilities. Radhika ‘s enriched experience will add another chapter of success to the property”.